Need some help with Saturday Night Bloodfest? Check out these cheats, hints, tips and walkthroughs. New info is added regularly. Play Saturday Night Bloodfest now! Find more Crazy Monkey Game Hints and Tips. Fight through the hordes of enemies in each room, complete the various challenges, and of course make a huge bloody mess! 1) Health - Don't let this drop to 0. 2) Powerup - Will show which powerup you have and how much time is remaining for its use. 3) Weapon and Ammo - Shows which weapon is equipped and how many bullets you have before you will reload. 4) Multiplier Powerup - Shows the value and time remaining on a multiplier powerup. 5) Score - How many points you've accumulated. 6) Kill Multiplier - Every enemy that's killed increases your multiplier by 2/3. It drops faster the higher its value. 7) Weapon Point Indicator - Shows if you have one or more weapon points available. Click it or press 'P' to access the powerup menu. 8) Blood Meter - Shows your progress to acquiring another weapon point. Shooting enemies causes this to fill. 9) Progress Meter - Shows how the progress through the room. When it's at the top, it's time for mop up! 10) Toggle Sound and Music. 11) Toggle anti aliasing quality. Fire Bullets - Every bullet you shoot catches fire and bursts through lines of enemies at the cost of reducing the bullet's speed and range. Super Magazine - No need to reload with this powerup. Your magazine stays full for as long as the powerup is active. Super Speed - Double your running speed for a short time. Orb Shield - Two orbs spin around you killing any enemies that come in contact with them. Just don't let them get past the orbs! Invincibility - You will be rendered invunerable to enemy attacks as long as this powerup is active. Full Health - Heals you completely. Multiplier - Every hit is multiplied by the value of the powerup (2x, 3x, and 4x). Presents - Collect these for additional score! The different colors hold different score values ranging from 100 points to 3,000 points. Grunt - Standard enemy, don't get too close or they'll pummel you with a baseball bat! Splitter - Similar to the Grunt, except when they are killed, they split into two. Don't get overwhelmed. Shooter - This one shoots back. Has high HP as well. Exploder - Explodes into four fireballs when killed. Don't be in their path when he does! Doom Machine - An enormous treaded mech that has every intention of keeping you from the prize. Upgrading weapons and choosing the best path that suits you is necessaray to create a higher body count, more blood, and move on to new rooms! Shooting enemies and filling your blood meter will give you weapon points to spend on new weapons, health upgrades, or score bonuses. Weapon upgrades only go one way, however. Once you've upgraded to a new weapon you can only move forward from there. Handgun/Dual Handguns - The most basic weapon. Semi Automatic and low damage. Magnum/Dual Magnums - Highly powerful but low capacity and Semi Automatic. Machine Pistol/Dual Machine Pistols - Extremely high rate of fire but low damage. Reloads are near instantaneous. Perfect for racking up a huge score, but not as good at actually killing enemies. Laser Pistol - Very fast rate of fire but low damage. Laser Rifle - Low rate of fire but good damage. 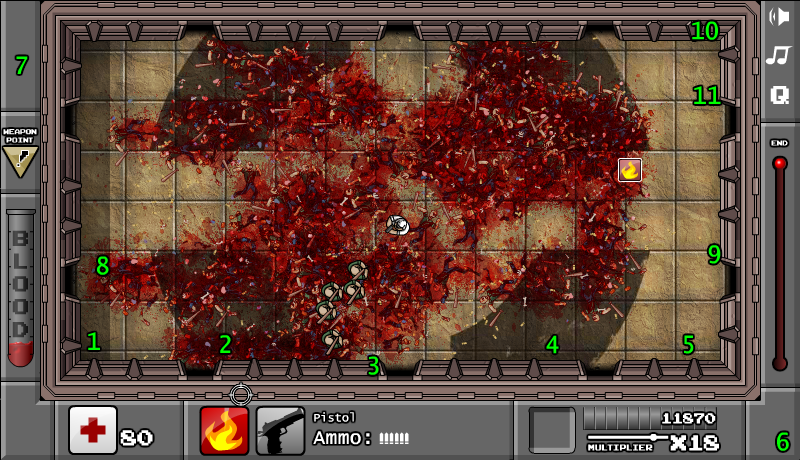 Lasers penetrate through multiple enemies. Laser Cannon - High damage and low rate of fire. Lasers penetrate through multiple enemies. Laser Gatling Gun - Very fast rate of fire and high damage. Lasers do not penetrate multiple enemies. SMG - Average rate of fire and damage, but fully automatic. Assault rifle - Fast rate of fire and good damage. Light Machinegun - Very fast rate of fire, good damage, and very large magazine. Has a slow reload speed. Battle Rifle - Excellent damage and average rate of fire. Double Barrel Shotgun - Good damage but can only fire twice before a reload. Pump Shotgun - Good damage and larger magazine than the Double Barrel Shotgun at the cost of firing speed. Semi-Auto Shotgun - More ammo and more damage than the Pump Shotgun. Auto Shotgun - Fast rate of fire and high damage. Increases the maximum health your character has and provides a full heal. Instant 25,000 times the number of times it's been used. Use health upgrades tactically. They offer a full heal, so upgrade when your health is low for a free heal. If one path of challenges is too difficult, try a different path. There are many routes to take. Plan your routes to powerups. Sometimes it's not worth it to dive through a horde of enemies for that 100 point score bonus. Consider the cost of upgrades and what's the most economical route. Can't see your character well enough? You can change the color of their outfit at any time on either the title screen or if you pause the game and go to the options screen.